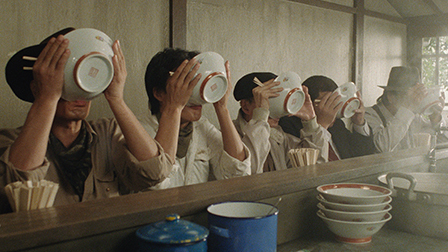 Everyone in writer-director Juzo Itami's crowd-pleaser “Tampopo” (1985) has strong opinions about food, from stuffy businessmen to dapper yakuza to homeless men who speak passionately of the virtues of Pichon Lalande while huddling for warmth. If the baby we see suckling contentedly at momma's breast could talk, it would surely be rating the milk for both temperature and sweetness. Itami serves up numerous side dishes along the way in the form of a series of vignettes unconnected to the main narrative. A fussy woman instructs her female charges on the proper etiquette for eating spaghetti without making a sound (it's considered rude abroad, she notes), but when they hear another man in the restaurant inhaling his pasta with abandon, they all follow suit with glee. A ramen sensei (in what turns out to be one of those ubiquitous ramen novels we all know and love) instructs his pupil on the proper way to consume the soup: “Quietly apologize to the pork.” A white-clad gangster (Koji Yakusho) returns periodically, sometimes directly addressing the audience when not occupied with food-assisted frolics with his very game girlfriend. If you think every scene in a movie should advance the story (by which I mean if you've written a book on Hollywood screenwriting), you might get annoyed. If you can just savor each moment and each personality for its own textural qualities, you should have fun, which is obviously what Itami is after. 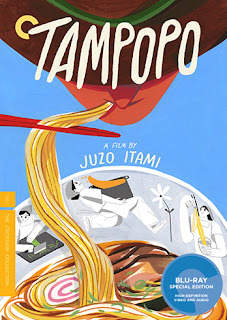 In “Tampopo”, both food and film are intended to be enjoyed by everyone, and in precisely the way they wish to enjoy it all. Just as long as it's done with passion. The film is presented in its original 1.85: aspect ratio. Criterion's “new digital restoration... in 4K resolution” is razor sharp and pops with rich color. I don't own a previous DVD copy of this, but I remember thinking the film looked a bit washed out. That was obviously a product of the transfer and has been more than taken care of here. This looks great all around. The linear PCM mono track is crisp and fairly simple in design. Itami mixes in some comic sound effects (to accentuate noodle slurping, for example) but nothing too complex. The playful score by Kunihiko Murai sounds strong as well. Optional English subtitles support the Japanese audio. Criterion's April releases sure don't cheat on the extras. “The Making of 'Tampopo'” (1985, 90 min.) is a documentary shot during the film's production. Narrated by Itami, it's fairly superficial and probably a bit too long, but it's fun for fans. The disc includes new interviews with lead actress Nobuko Miyamoto (2016, 11 min.) and food stylist Seiko Ogawa (2016, 16 min.) Miyamoto discusses her conception of the character as well as working with Itami, who was also her husband – they remained married until his death in 1997. “Tampopo” is often given credit for popularizing ramen abroad and even invigorating the ramen scene in Japan, and Ogawa discusses the film's contribution to food culture. A similar discussion continues in “The Perfect Bowl” (2016, 22 min. ), featuring interviews with several chefs as well as ramen scholar Hiroshi Oosaki. “The Amateur and The Craftsperson” (2017, 10 min.) is a short video essay by filmmakers Tony Zhou and Taylor Ramos, which argues that the film's central theme is the role of the amateur in appreciating aesthetic experiences. “Rubber Band Pistol” (1962, 32 min.) is Itami's first film, and it's rough and messy and quite enjoyable, if a bit unwieldy in that uncomfortable “too long to be a short, too short to be a feature” zone. The slim fold-out insert booklet includes an essay by good and culture writer Willy Blackmore. Since I'm definitely not a foodie (I love food – I just don't care much how it's made, as long as it's plentiful), I sometimes don't fully warm up the most beloved food movies, like “Babette's Feast” (1987). “Tampopo” is an exception. It's so sweet, sincere, and funny (oh, yeah, and also really well-made) I can't help but enjoy it. “Tampopo” won a world-wide cult following when it was released, and its appeal remains undiminished more than thirty years later.